This paper knife made out of carbon steel instead of brass can be used like a real cutting blade for smaller things. Aluminium handle for stronger handle. 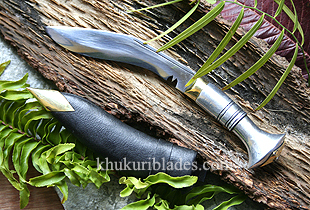 It is the replica of an original gurkha kukri however in very small size. It is used as letter opener or as paper cutter. It makes a perfect gift and souvenir. Tourists visiting Khukuri House Thamel in Nepal buy dozens to take back home for friends and family. This is the smallest kukri made by this house. Many different of Paper knives are produced by KHT and this one is of real carbon steel with aluminium handle.